Hiking up the mountain at Fushimi Inari-taisha brings to you a near endless expanse of torii gates. This view is more simple, but still expresses the vast infinity you feel hiking through the mountains. This is early on and the deeper into the mountains you get the more the gates begin to thin out. The more too does nature take over and you less and less see other hikers. This is one of my favorite places in Japan, but please go early and be prepared to hike a long way to find some peace this wonderful place has to offer visitors. I have come to realize something about myself in this life. I deeply appreciate and love gardens. I love nature in general, and find a peaceful place where I can still my mind as I wander the natural world. I also realized I deeply dislike the actual art of gardening (and I strongly believe this is an art form). This is something I gave year after year of effort too when Pamela and I purchased our home, but the older I become, the more I realize you need to spend more time doing the things you love, and less time doing the things you do not love. That seems like common sense, but for so many of us, such a difficult thing to master. I know I was deeply moved by the gardens at Tenryu-ji, but raking this zen garden is not the same as communing with it. I sat on a small bench, the rain that had been falling my entire trip out of Kyoto to Tenryu-ji had mostly stopped, but a humid sheen cast odd colored light glares all over. 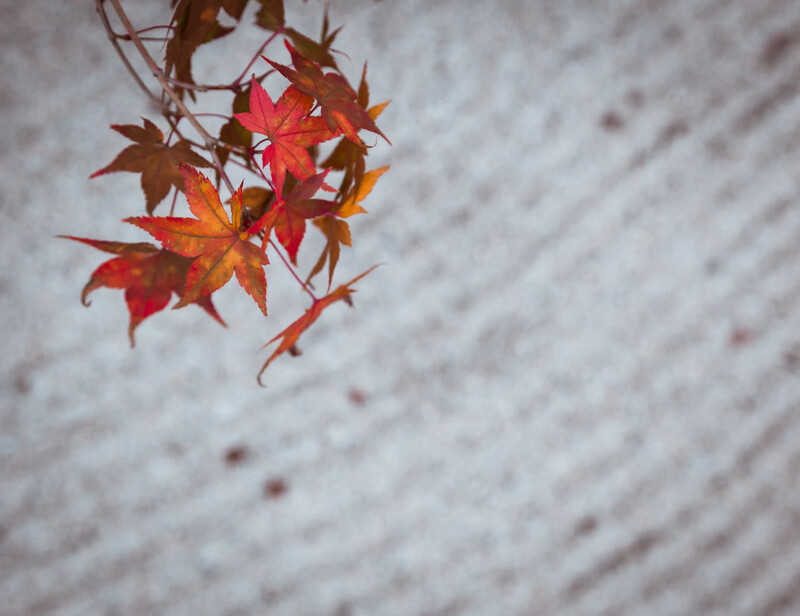 I sat taking in the Kyoto fall scene. I was a bit too early for the truest expression of color the city is capable of, but the beauty of Tenryu-ji’s gardens were not lost. Suddenly and in near slow motion, this near perfect maple leaf fell from a nearby tree. It floated gracefully to rest next to me on my wet bench. I took this as a sign and snapped this photo. I often try to find meaning in the small occurrences like this that happen on my travels, but perhaps this time, I will leave this leaf’s message for you to decipher. I think, if you listen, the universe sends you messages. I was hiking Fushimi Inari-taisha in Kyoto, Japan. The day was grey and rainy, but I had arrived early before the truly overwhelming mass of people. I also knew the physical toll the Kyoto mountains would take on many tourists and the further I hiked, the fewer people I would find. Furiously I climbed, passing people, stopping only for photos, perhaps I missed some things. All of a sudden, I came upon a lake surrounded by this fence, it was a welcome serene sight and a respite for the ever upward climb. It was then I noticed the snail, alone on the fence. People hurried by all to involved to notice the snail. In a flash, the Sun broke gloriously through the clouds and reflected power from the surface of the still water. The snail continued all the same, but I heard the message. 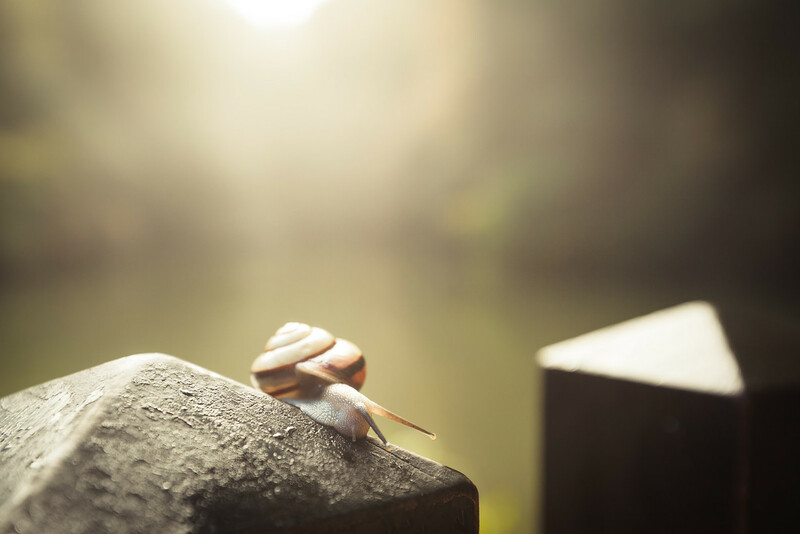 The snail was saying, “slow down”. The rest of my hike was alive with light, that danced off the rain drops still clinging to the endless Torii Gates of Fushimi Inari-taisha. 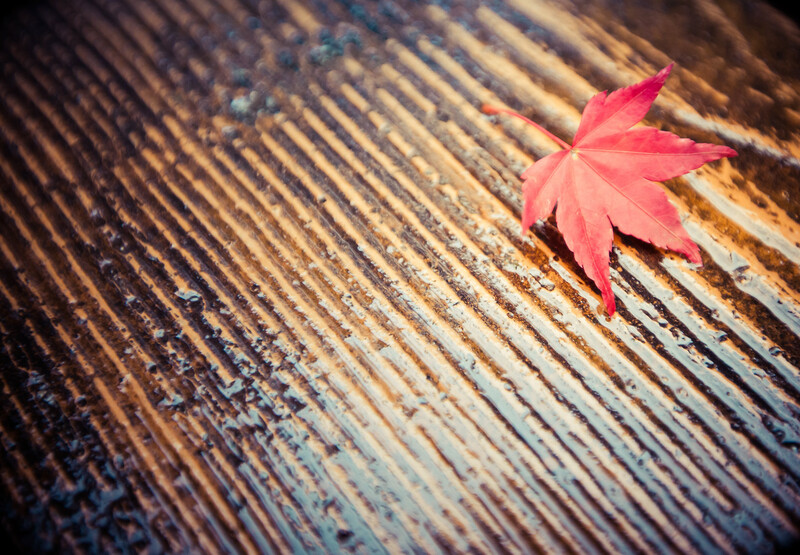 I did slow down, people came and went, but my speed now allowed them to pass by with ease, and me to linger to find things hidden in the Japanese wood. I took some of the best photos of my trip, because I listened. When I arrived at Fushimi Inari-taisha in Kyoto Japan there were a ton of people. I was also greeted with row after row of flags proclaiming the site on the best in Kyoto according to Tripadvisor (le sigh!). It’s not that I dislike Tripadvisor, on the contrary, they are often a relied upon site for travel info, but being voted one of the best also means TOURISTS! I was quickly overwhelmed, despite arriving early with the throngs of people. I realized in order to find some degree of privacy I would need to do one of my favorite things…hike! 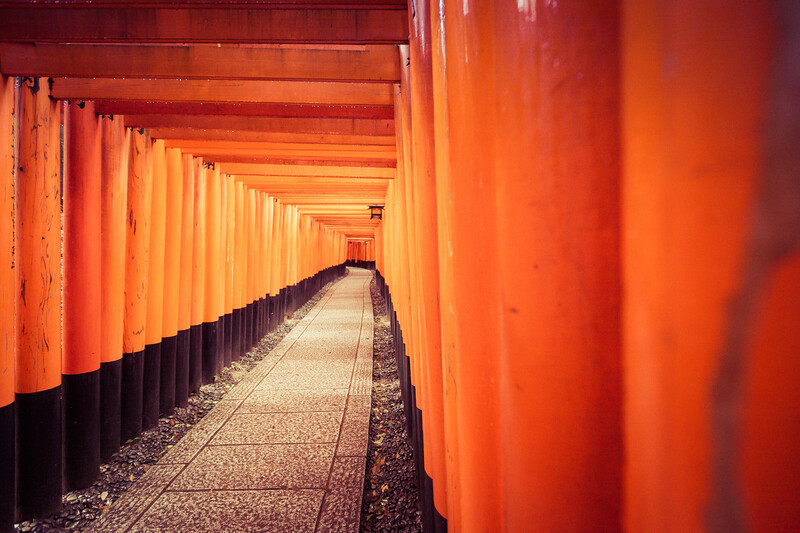 Fushimi Inari-taisha is a vast tract of land expanding up into the surrounding mountainside. Many of the temples are a considerable and arduous cardiovascular trek into the hills, and soon I was leaving the masses behind and spending some much needed time in the Japanese wilderness. In the end I have to say, Tripadvisor got it right Fushimi Inari-taisha is one of the best sites in Kyoto! 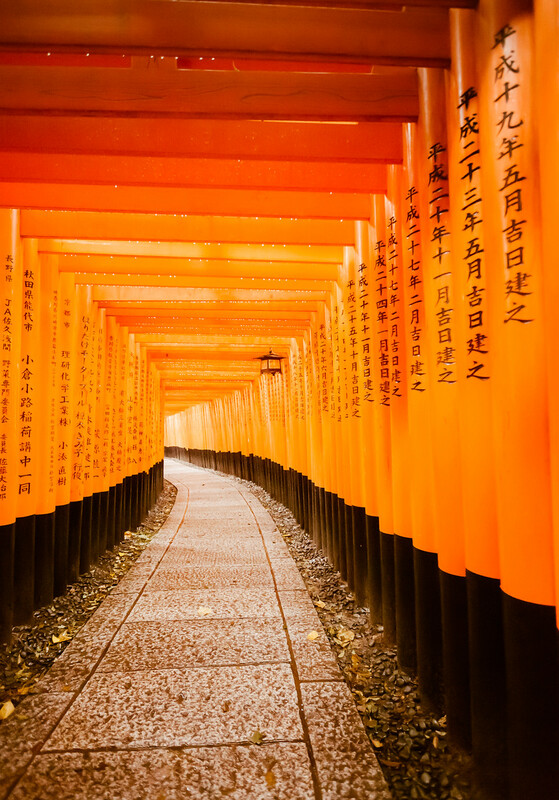 The major Shinto shrine in Kyoto, Japan is Fushimi Inari Taisha. It is one of the most amazing religious places I have see first hand (up there with Notre Dame and La Sagrada Familia). The Tori Gates go on and on and on, winding through the adjacent mountains and forests. The builders of this place must have loved nature or they wanted to get away from the THRONGS of people at the main entrance. I have seen prayer cards before in Japan, but Fushimi Inari Taisha had several including these great fox faces. The fox is a messenger in Shinto (I am NO Shinto expert) and who better to carry your prayers! Many of the people drawing were quite good artists! 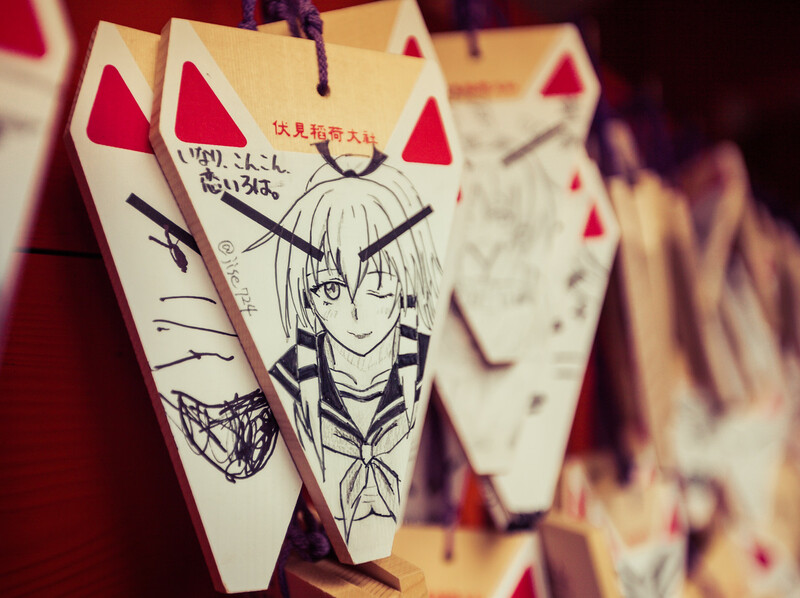 This anime girl caught my attention among the row and rows of prayers. In my short time in Kyoto, I saw SO many gardens. You literally run into them everywhere. I am one who has no patience for gardening, but I love the artistry OF gardening. This latest trip to Japan gave me a appreciation for imperfection. You can make something perfect, but in some things, say a handcrafted tea cup…the Japanese prize the imperfect. These leave are as I found them…imperfect. The pebbles in the karesansui are not uniform in color. My control of depth of field in the photograph was not how I saw it. These imperfections are, but an illusion for all are perfection. 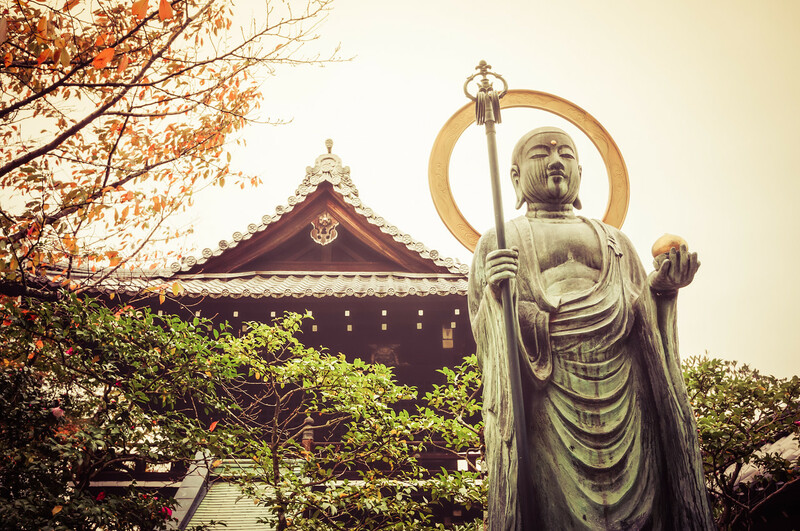 Temples and Shrines, and Buddha’s OH MY! Everywhere you go in Kyoto, there are shrines, temples and gardens. I can’t think of a place I went that didn’t have at least one or more of the three…sometimes all three at the same time! It is said Kyoto has over 2000 shrines and temples from small to exquisitely grand (in a zen way of course). Just walking down the sidewalk, I found this little temple. I said Buddha in my title, but perhaps a Bodhisattva or some other early divine person. With so many places to pray, it is sometimes hard for a western walker to know where they stand, but I think that is perfectly Japanese. The Japanese are a trusting lot! Before entering a Buddhist temple, you remove your shoes. Sometimes you carry them around in a little plastic bag, but generally you just leave them on a shoe rack by the entrance. The same is often expected if you are carrying an umbrella…best to not track water all over a temple or store. Of course, my shoes (not that anyone would want my traveling shoes) and my umbrella were always exactly where I left them. Not only are the Japanese trusting, they are also trustworthy! 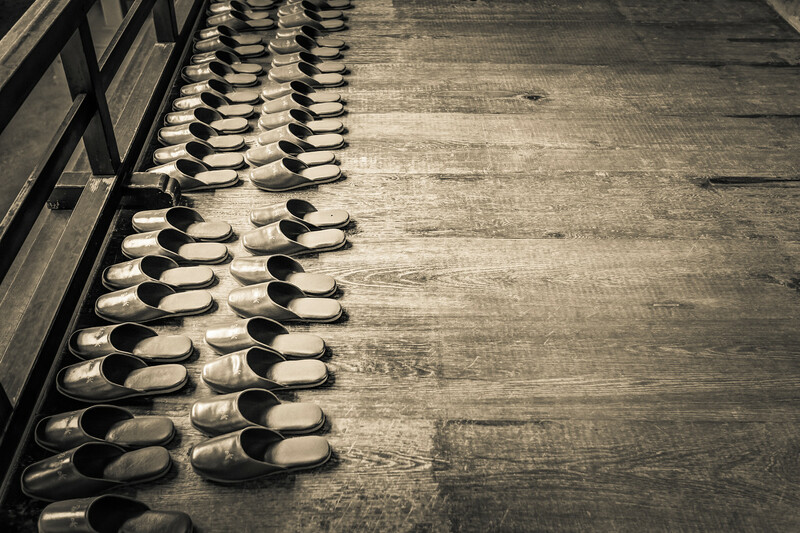 I just loved these neat rows of slippers the monks wear. 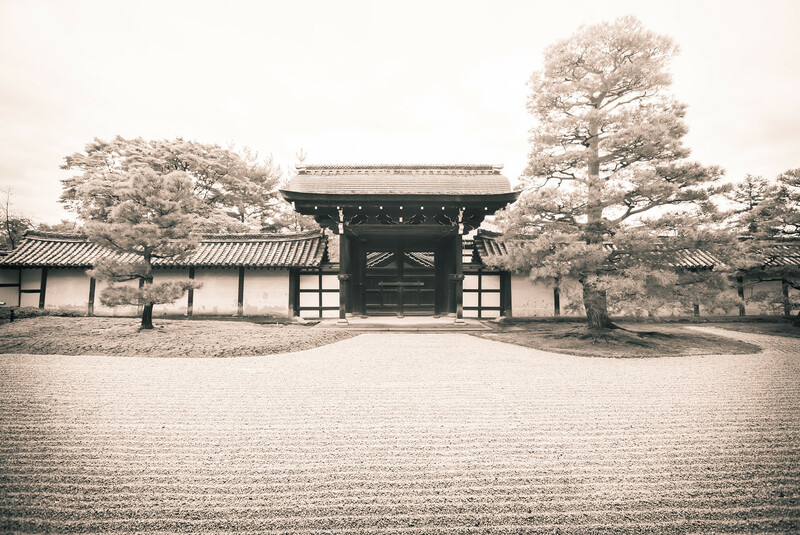 They were lined up outside what is functioning currently as the primary temple at Chion-in. Hitting fall color in Japan to me seems a bit like hitting the cherry blossoms. You can shoot for the perfect time, but nature sometimes has other ideas. Technically I was a bit early for the “perfect” fall color time, but the maples were just starting to turn! 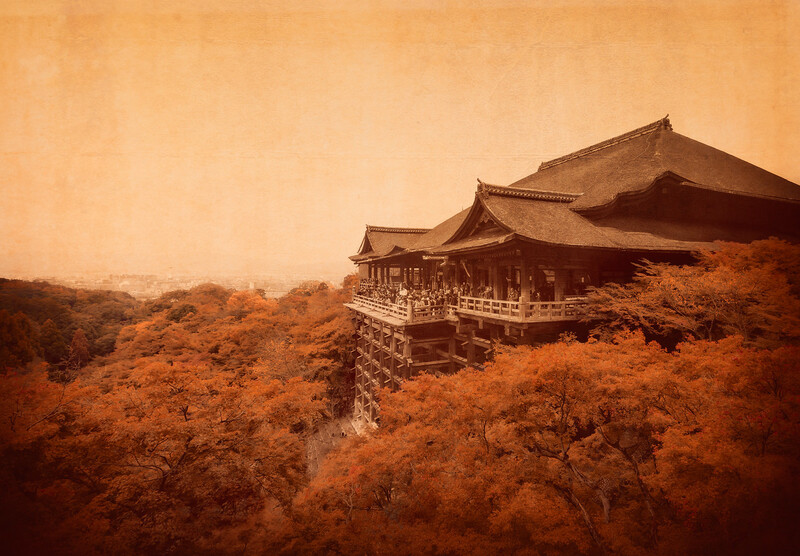 This is Kiyomizu-dera, a buddhist temple with a FANTASTIC view of downtown Kyoto. I actually came back on my last night in Kyoto, but realized when I arrived I didn’t have the entrance fee (I left my wallet back at the hotel). I had followed a big searchlight in the sky that brought me right back to this lovely spot.